Lake Geir is a lake in the western Rift. 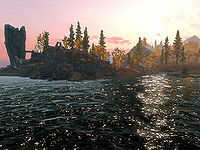 Ivarstead is located on the shores of Lake Geir. In the center of the lake there is an island which is home to Geirmund's Hall. The lake is fed by the Treva River and is drained by Darkwater River. On the eastern shore is a row boat containing two sacks beached opposite a small island with a tree stump. On the island there are two treasure hunters who will attack upon seeing you. They have dug up an unlocked chest containing minor loot. You will find two white cap and a mora tapinella that can be harvested on the island. Further inland is their camp including a small tent, two bed rolls, an open, empty chest, four sacks and three barrels, one of which has on it a bottle of Honningbrew mead a small coin purse and a note directing you to the treasure on the island. There are also three rabbits hanging beside the tent that can be harvested. There is also a woodcutter's axe next to where the rabbits are hanging. This page was last modified on 13 February 2018, at 12:14.